Four Points Home Medical is a full service home medical equipment company. We carry a full line of diabetic supplies ranging from monitors to shoes. Diabetic customers can choose from a complete selection of diabetic monitors, glucose strips, lancets, testing solutions and devices, as well as diabetic shoes and skin care products. Whether you are looking for speed, accuracy, lightweight or any other criteria, our selection of glucose monitors is sure to h ave a monitor to suit your needs. Also choose from many styles of shoes from everyday walking to casual. 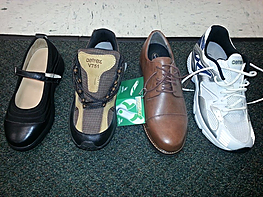 Come by and check out our full selection of Diabetic shoes at Four Points Home Medical. Also in stock you will find a selection of diabetic socks, shoe inserts, foot care products as well as Leg stockings from Ted’s and Jobs. A Lift Chair is a device that gradually lifts the person to a standing position or gradually descends the person into a sitting position without causing any injuries. It has the look and feel of a normal recliner which makes it very comfortable for the individual. Most lift chairs plug directly into the wall, but feature a backup power supply that is activated when the power goes out. Many people who are mobility challenged depend on their lift chair to stand and could not do so otherwise without assistance. The battery backup ensures that they will never be left without this precious resource.